The most infamous bit of cheating in 2010 was by Luis Suarez against Ghana when he handled the ball on the goal line. In his post–South Africa career, Suarez bit two players, completing the hat trick in Brazil by sinking his teeth into Giorgio Chiellini of Italy (a team so dedicated to time-wasting, stifling defensive tactics, and a general reluctance to play football that one wonders why they even wanted to progress in the competition). Much argument ensued as to whether Suarez merited the opprobrium heaped upon him. Was biting worse than challenging an opponent so recklessly that you could break his leg or—as happened to the host’s ill-starred star, Neymar—back? That debate missed the point. It was not the physical harm inflicted that appalled; it was the sly attempt at provoking Chiellini into retaliating, conceding a penalty, and getting sent off. After claims by the Uruguay team that bite marks had been Photoshopped, Suarez gave the “true” version of events: that he had lost his balance and accidentally embedded his teeth in Chiellini’s shoulder. This combination of cynicism, cheating, and deceit marks Suarez as the vilest great footballer in the history of the game. Compare this photograph—where he sits on the grass like a whining toddler, alleging, in a tail-wagging-the-dog way, that he has been shouldered in the mouth—with the one capturing the moment that Maradona handled the ball past England goalkeeper Peter Shilton in 1986. It’s an incident that might have been expected to have lived in infamy, but even the English have pretty much forgiven El Diego, partly because his other goal in the same game was so wonderful that they are now pleased to have played a part in it. 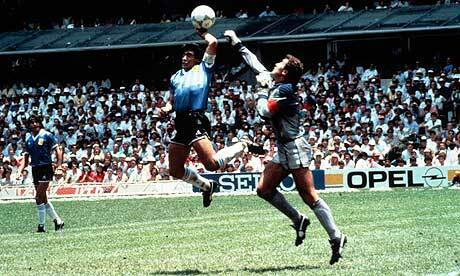 We’ve also come to admire the sheer cunning of the hand-of-God goal, which was at least ball-related. Suarez’s bite, on the other hand, was so entirely off-the-ball that it was difficult to see how he had ended up—as this photograph suggests—sitting on the ground playing air harmonica. The only clue is Chiellini’s gesture: either an appeal to the ghost of Mussolini or a version of what Joseph Brodsky calls “a mute up-yours-even-unto-the-elbow.” Given that we now know Suarez to be capable of anything, Chiellini might be claiming that the Uruguayan had, so to speak, really made a fist of it, that he was the victim of an up-mine-even-unto-the-shoulder.